Being one of the first to see the new generation redone / non original some while ago, I bought one for further study. Aftyer examine the details of the dial by picture on the computer, the print was as good as perfect. I got even more concerned after I saw it in the flesh at Miami Watch Show. Besides me, almost everybody that was looking up close, believed it was good, the scoop of the show, haha! Still the dial structure was flat but the more convincing was the old style printed ‘6200’ crown and text. Although I had my reservations it was to good to be true. Once at home we took the dial out and checked it up close with a microscope, that done, you see the print is ‘bleeding’ and not as sharp as original ones. A new technique has been born, printed on lookalike Rolex ground plates making it very hard to distinguish. 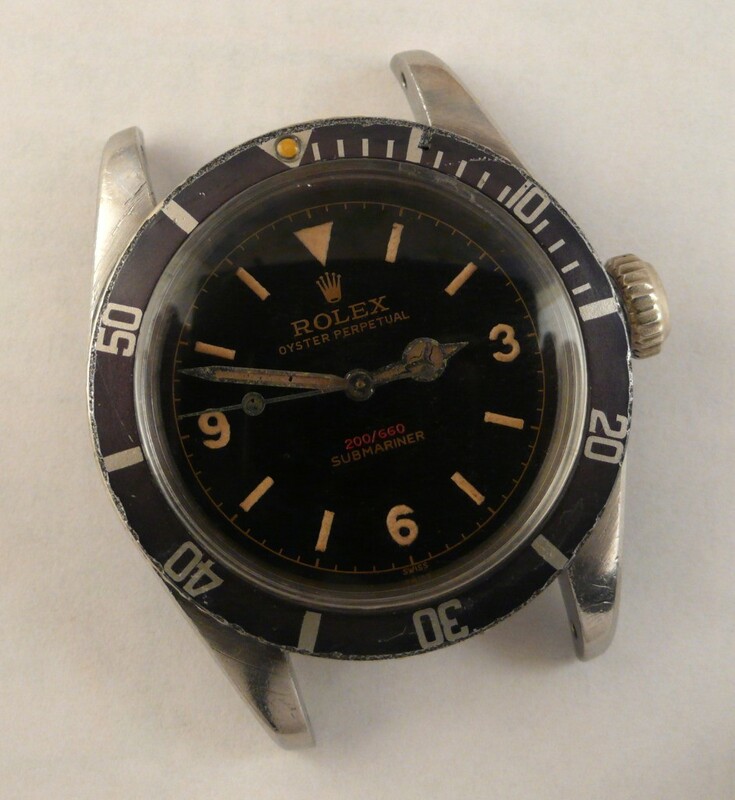 Best technique to spot a early 50-ies redone dial is to use your geiger meeter to check up the radiation it’s (yet) was not close to the high radiation level original Rolex ones have. 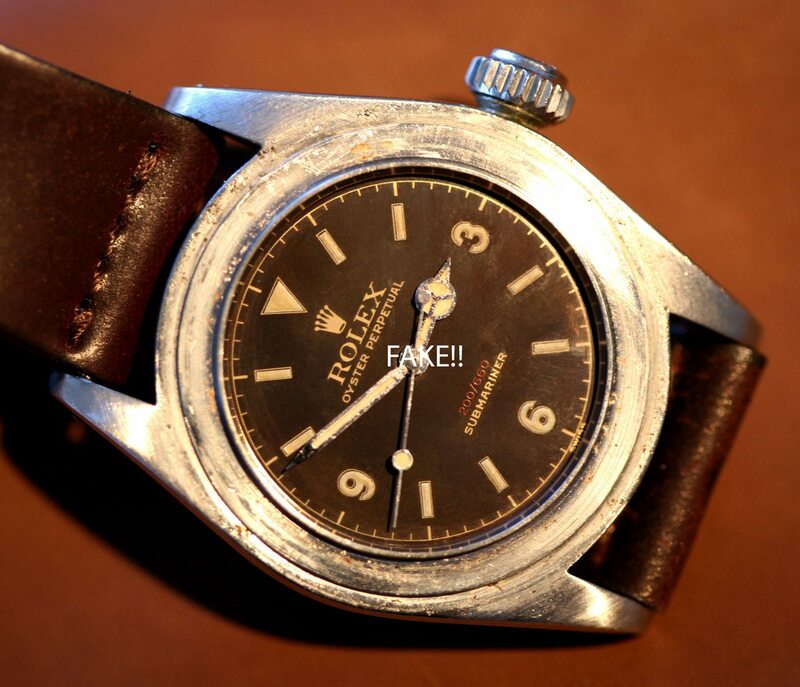 Please be aware the below Rolex is NOT having a original Rolex dial. We finally found the source where these dials got born and proof of their practice. Once it’s offered in the market as REDONE it’s ok with me, what will happen with it when the next owners offers it, maybe as original, the damage can catastrophic. Check it up yourself.. Everything is Rolex EXCEPT the dial!! Be AWARE!! it’s creative but FAKE! TIP: To see all details closely, click on the picture below, then expand the image with right top corner button to maximum the size! 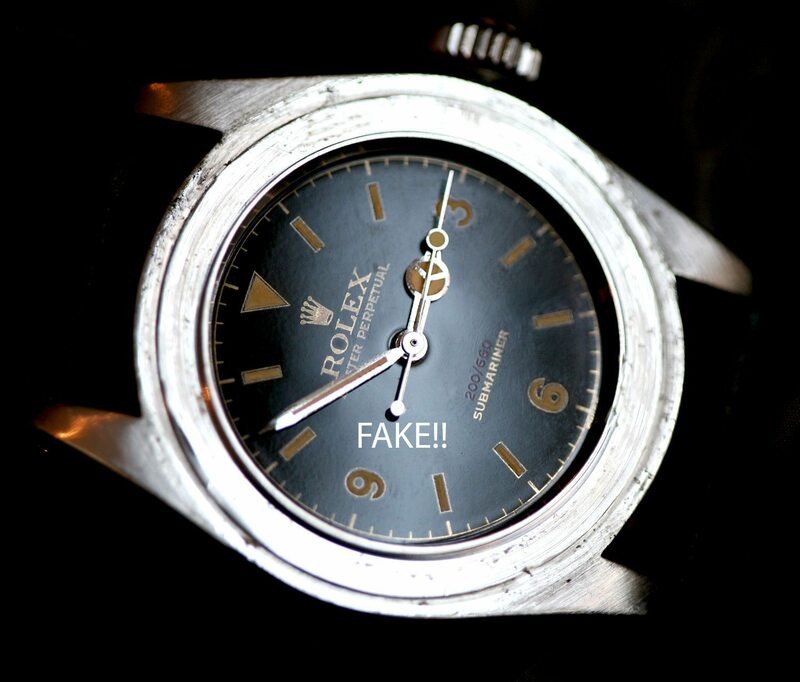 NOT Original Rolex dial but instead a NEW Generation REDONE / FAKE !! To make it even harder to spot, the depth print, 200/660 is also as original, on TOP of the lacquer. Ones you study it with microscoop, one spots the differences easily. 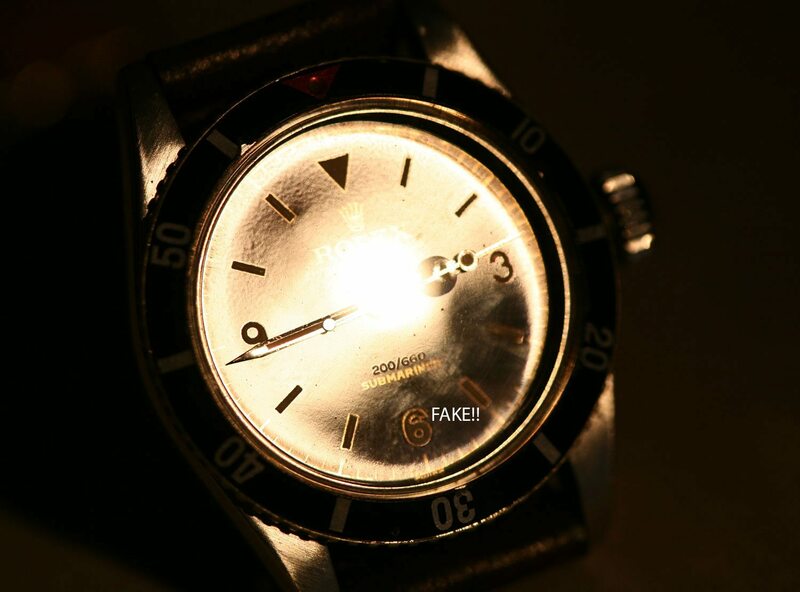 New industrial technologies make better fakes ;-( Be AWARE !! 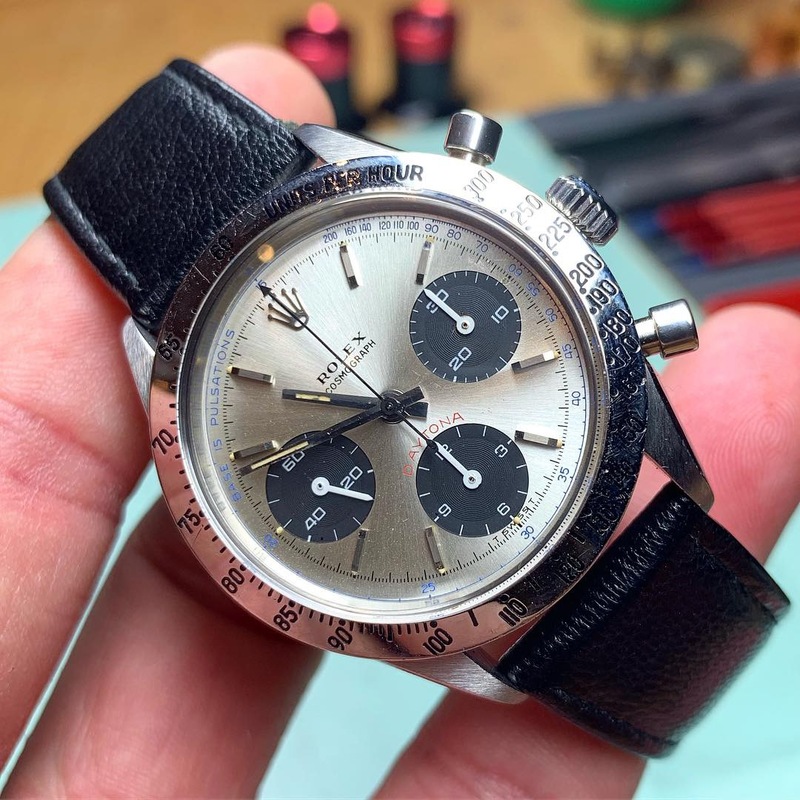 Here’s another one that got CLEARLY offered as Completely REDONE on EBAY, check it out here Different crown, same technique! NOT original!! When you doubt yourself when you spot one, you can always send me a email so I can help you out finding the truth! One think is for sure, they become better and we’ve to be prepared! This post was written by Philipp on July 27, 2012.